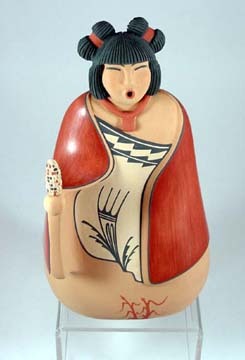 This is a truly magnificent piece of pottery sculpture by Maxine R. Gachupin Toya (signed Maxine Toya with a Corn Clan hallmark) one of the outstanding potters from Jemez Pueblo. 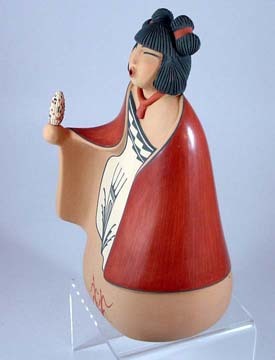 Maxine was born April 25, 1948 and has been active in creating some of the most stunning and appealing pottery sculptures in Jemez since 1971. She comes from a family of incredibly talented and prolific potters beginning with her grandmother, Persingula Gachupin, her mother, Marie G. Romero, and her sister, Laura Gachupin. 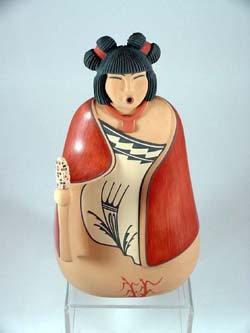 Her repertoire includes matte polychrome and polished redware storytellers, Corn maidens, clay sculptures, figures, miniature Kivas, owls, textiles, prints, paintings and writing. This a truly remarkable artist whose work on clay has been distinguished time and again with an arm-length of awards in some of the most prestigious pottery exhibitions such as the Santa Fe Indian Market, the Eight Northern Indian Pueblos, the New Mexico State Fair, and others. 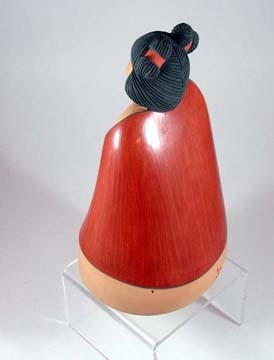 This figurine is one of Maxine's corn maidens. It is quite large, measuring 12 inches tall by 6 1/2 inches deep. No serious collector of native American pottery, especially storyteller pottery should miss the opportunity to own a piece by this most renown artist.